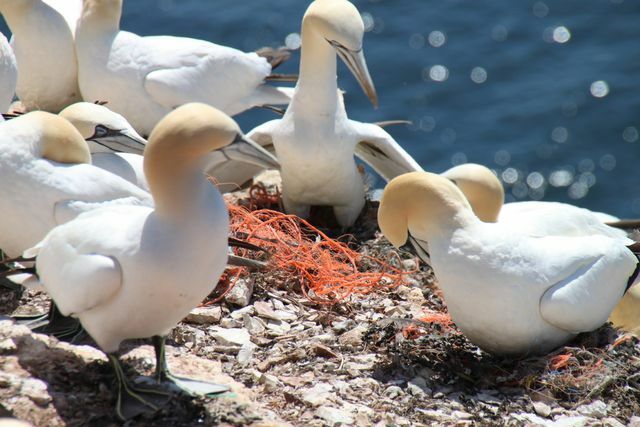 Researchers are discovering a growing amount of plastic litter in the polar landscape and in the stomachs of marine birds. The trend is predicted to worsen as Arctic sea ice shrinks and shipping traffic increases, but slowing it will require a global effort. Melanie Bergmann didn’t plan to study the accumulation of plastic litter in Arctic waters. Based at the Alfred Wegener Institute, Helmholtz Centre for Polar and Marine Research (AWI) in Bremen, Germany, most of Bergmann’s research focuses on the marine creatures living on the seafloor. But while reviewing a series of underwater images taken over several years from the HAUSGARTEN, AWI’s deep-sea observatory in the eastern Fram Strait between Greenland and Svalbard, she began to wonder if she was seeing more underwater litter. To confirm her suspicions, Bergmann launched a formal study. She reviewed hundreds of images from one of the observatory’s stations taken between 2002 and 2011 and found that the amount of litter on the sea floor had nearly doubled, reaching a level similar to that found off the coast of Portugal – a more heavily populated area than most parts of the Arctic. One of Bergmann’s students followed up with a similar study of underwater images gathered at a station about 60km (37 miles) farther north. In an unpublished study, she detected a 23-fold increase in litter between 2004 and 2014. Bergmann’s work is part of a growing body of research examining the rise of macroplastics and microplastics (pieces of plastic greater or less than 5mm/0.2 in. in length, respectively) in the Arctic. She has gone on to count plastic debris at the surface of the Barents Sea and Fram Strait, finding slightly more litter there than has been recorded in the Antarctic. 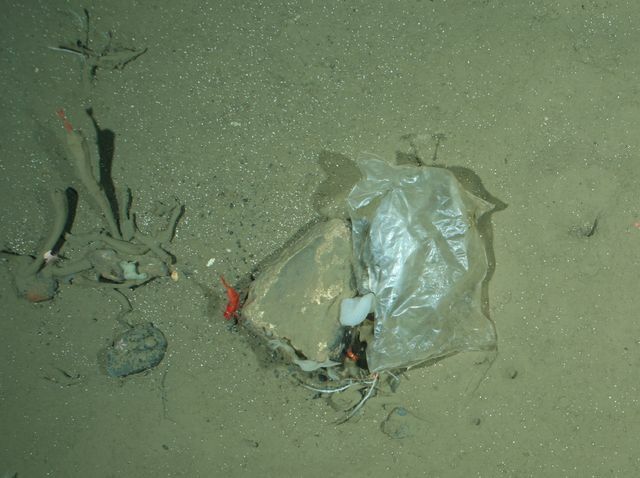 The amount of plastic at the surface, however, was still hundreds of times lower than what she’d observed on the ocean floor, suggesting much of the plastic in the Arctic is sinking out of sight. Research shows that plastics absorb contaminants, such as persistent organic pollutants (POPs). POPs can be harmful when ingested by wildlife, their toxic effects magnifying as they travel up the food chain. But the relationship between plastics and POPs, and whether plastics have a toxic effect on wildlife, is still being studied. Melting sea ice, resulting in increased shipping traffic, could further exacerbate the issue, in part by bringing more human beings – and therefore more litter – to the region. But sea-ice loss could also add to the plastic soup by releasing its own cache of plastic. In a recent study, Rachel Obbard, an engineering professor at Dartmouth College in Hanover, N.H., found that five ice cores extracted from the Arctic Ocean and the Chukchi Sea revealed a concentration of microplastics several orders of magnitude higher than any recorded samples from the world’s oceans. She proposed that as the Arctic sea ice forms, it traps particles of microplastics, which it can later release, contaminants and all. In fact, Obbard says Arctic residents have already observed it. “After I published the paper, someone contacted me from [Ulukhaktok, N.T.]. He said, ‘I’m a teacher here, and our people cut sea ice and melt it for drinking water on occasion, and we’ve actually seen these particles in the drinking water,’” said Obbard. One way to prevent plastics from building up in the Arctic Ocean is to figure out where they are coming from. In the summer of 2014, Amy Lusher set out for the southern coast of Svalbard to sample the water for microplastics. Lusher, who was a PhD student at the Galway-Mayo Institute of Technology in Ireland at the time, hypothesized that ocean currents in the North Atlantic could be pushing plastic litter to the Arctic. Researchers are also unsure of the consequences microplastics have on the Arctic environment. Their effects on marine life have been studied only in laboratory settings and are not fully understood in the wild, said Lusher. For macroplastics and larger animals, it’s a different story. “In the Canadian Arctic, 85 percent of [northern] fulmars have plastics in them,” said Jennifer Provencher, a PhD candidate at Carleton University in Ottawa who has been working with Inuit hunters, in collaboration with Environment and Climate Change Canada, in the Canadian Arctic to gather and study marine birds. Most fulmars in the low Arctic have on average a dozen pieces of plastic in them; in the high Arctic, they are generally found to have fewer pieces. Northern fulmars, she said, are thought to be particularly susceptible to ingesting plastic because they feed at the ocean surface, but there’s no evidence the plastic is fatal. Still, their state hints at the possible fate of marine birds across the Arctic. A modeling study in 2012 showed that a sixth garbage patch may be forming in the Barents Sea. What does this mean for efforts to mitigate the accumulation of plastic in the Arctic? It would be most effective, said Lusher, to limit plastic at the source, preventing it from entering the ocean in the first place. There are some efforts underway to do just that. In early February, Canada’s Ministry of Environment issued a call for public input as it drafts regulations to ban microbeads. These plastic particles, commonly found in cosmetic and cleaning products, wind up in waterways that empty out into the oceans. In January, U.S. president Barack Obama approved a bill banning microbeads as of July 2017. Banning microbeads is a “good first step” toward curbing the input of plastics to the oceans, said Lusher. But studies have not found a high concentration of microbeads in the Arctic, she added. There, the majority of microplastics are composed of fragments of larger plastics, such as fishing nets. “It’s all about encouraging the public to realize what’s happening in the ocean before we can fix it,” she said. This story originally appeared on Arctic Deeply. Samia Madwar is a writer and contributing editor at Up Here, the magazine of Canada’s far North. Her work has also been published in Canadian Geographic. For articles and updates, visit samiamadwar.com.